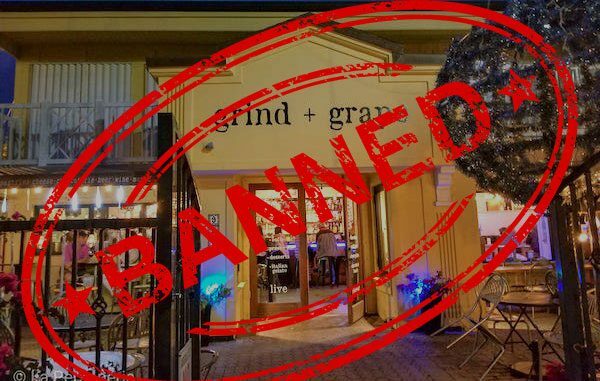 Grind + Grape bans customer for sharing a review in Vero Beach, Florida. SEBASTIAN – Grind & Grape in Vero Beach has banned people for sharing a recent Sebastian Daily review that wrote about their bad service. “I shared your article Friday morning. I did not expect to receive messages at 1:00 a.m. on Sunday morning from staff members saying I am banned for sharing the article,” the customer said. The customer wishes to remain anonymous, but we do have the screenshots of the chat between them and a Grind & Grape employee. There are four others who were also allegedly banned. One of them wrote Grind + Grape a long apology “begging for forgiveness” to return, according to the patron. The customer said they’ve been going to Grind & Grape in Vero Beach for two years now with friends. “It appears this place would rather coerce people out of their Freedom of Speech, rather than improving the business,” the customer added. The ban comes after Sebastian Daily published a Grind & Grape review about their bad service, bartenders lashing out at customers, and people being served ahead of others because of favoritism. “Grind & Grape in Vero Beach is lacking experienced management which leaves the staff undertrained. The one bar is understaffed, the cocktail servers on the patio are unable to keep up with orders and are seen carrying empty glasses one by one to the kitchen,” the review said.